Today marks the Autumn Equinox here in the northern hemisphere, and I pause at this liminal time to consider the harvest of this online journal. When I began writing here just past the fall equinox in 2008, I promised myself and my readers I would write something to honor every turn of the Wheel of the Year. It is a large body of work at this point; this will in fact be my 100th post in this category, Wheel of the Year. That is ten years of faithful writing. Today I cherish this archive. I frequently refer to it myself. But my writing energy is going in another direction now. I will still post the random sabbat musing, and I will continue posting on all the other subjects I love. But I am taking myself off the schedule. It has not been a bad thing, to have to show up and write when I didn’t feel like it. It helped me keep the writing muscle tuned and limber. But truly, if I don’t give this other project my all, it will never be done. I would say I have found my voice here in these “pages” but I heard from an old friend of forty years ago – one of the sweetest gifts of having this public persona – that she found me here and knew it was me by recognizing my writing voice. I can hardly express how important that was to me, to know that I have been in a continuum all these years and though I may have refined my style, I am still me, the writer who first appeared when I was a child, and who now has me by the scruff of the neck in a hammer lock. Hmm, seems like I still mix my metaphors, but it all goes into the writing cauldron. Sorting and culling is another kind of job, one that I wrote about here, in my exploration of the flow and the forge. 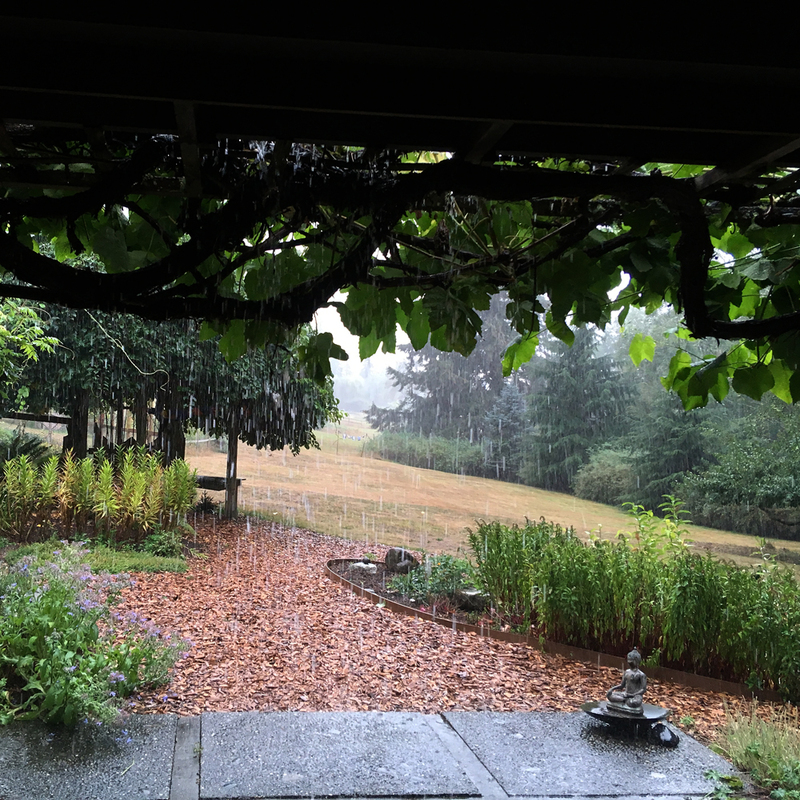 I’ve just returned from an extended trip to the Pacific Northwest, first to attend a lovely wedding in Oregon, and then on up to Washington to immerse myself in the spiritual work of the Gaian Soul Retreat, which I first attended last year. More to come on that experience, perhaps; I am still assimilating it, but suffice to say it was rich and deep. While traveling, my writing project was much on my mind, as I saw symbols of the process all around me. 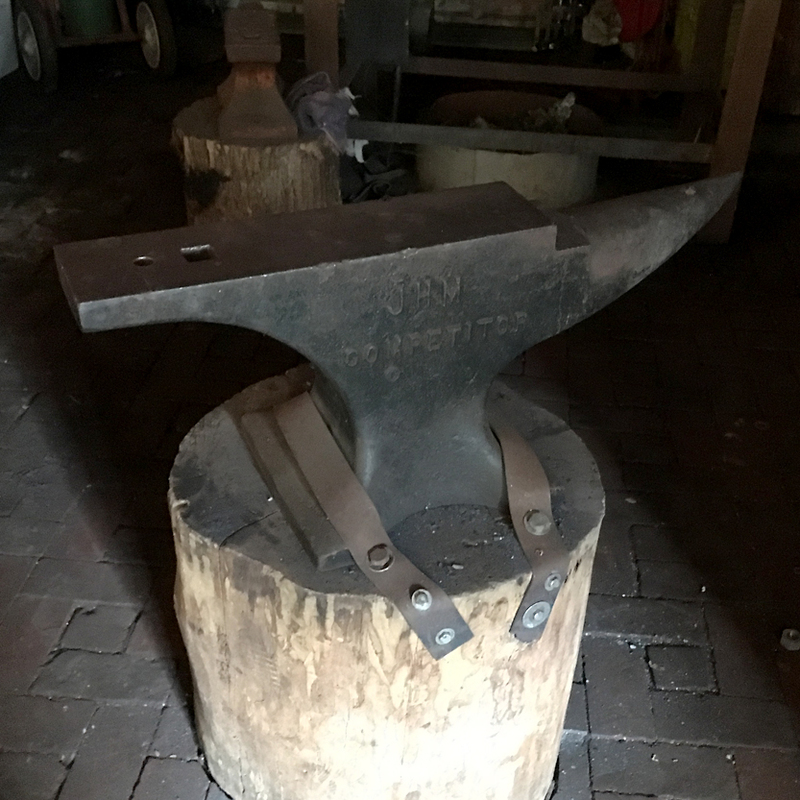 At the Dodeca Art Barn where the wedding preparations were staged, I came across this massive anvil, pictured above. For me, no more profound symbol of the forge exists than this object. I have been in the fire of creation this summer, writing every day, by turns delighted and overwhelmed with the flow of words. 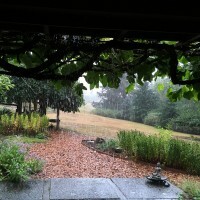 By the time I got to Aldermarsh on Whidbey Island, I was grateful for the first rain of the autumn, which arrived at the retreat center on the same day I did, a perfect feeling of flow, and to add a little steam to that fire in my head. 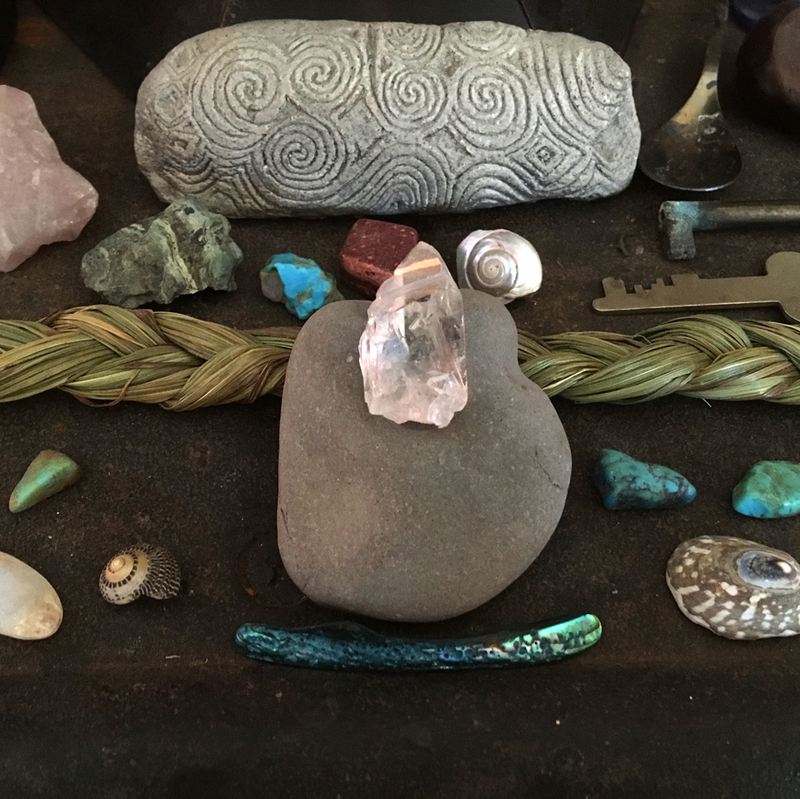 Returning home, I was glad to resume my morning devotions at my hearth altar, though it did take me several days to ground here. I have rested a small crystal in the hole of the hag stone I collected earlier this summer. This is, to me, an emblem of fire grounded in earth. The fire of creation can consume me; containing it in words on the page gives it form and longevity, not letting it burn out too fast. I will still post here. There are calligraphy and handmade book projects from years past I would still like to share, and I do still get my nibs wet or stitch a book. I may share some of my shorter creative writings in the Library, unrelated to the big project, but exercises that more or less stand alone. Meanwhile, there is much to harvest here: words and ceremonies, art and musings, ponderings and wonderings. I have not often shared my agonies, but I believe some of those will be forthcoming in the book. When I don’t have time to write an entire post, I’ll share favorite photos on my Instagram account. I also occasionally share on my Facebook page, which is also a public account, for I don’t fool myself that anything I put on the internet will remain private. I have many more readers now than I did when I started, and I encourage you, if you like, to look at these past posts to glean ideas for your own altars or observances. The Wheel of the Year category takes you to the whole offering, and each sabbat is also tagged with its own name, so there are two ways to search. I have reaped much joy from this seasonal devotion of words and images, and it pushed me to find the kernel of what each turn means to me. 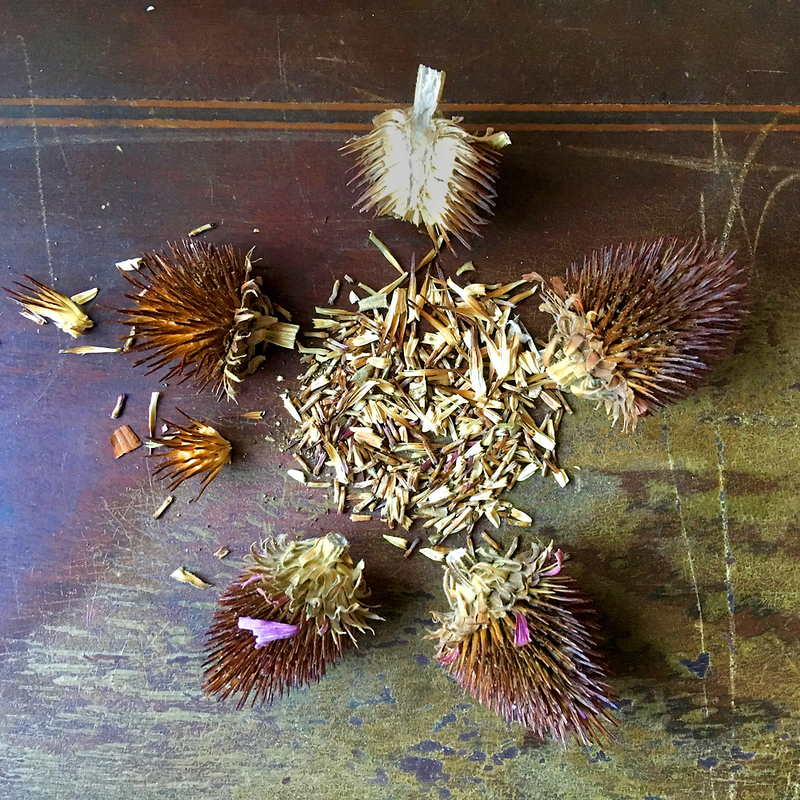 Like the echinacea seed mandala I made to honor this harvest time, I like to think that I have scattered some seeds of healing and maybe a bit of wisdom in all the chaff of these pages. Thank you for your insights into this crazy world and for sharing them. You are a most wondrous, precious person for me, sweet Cari. Thank you, Julie. I cherish our friendship! They speak of ‘decades of the rosary.’ This decade of spiritual writing practice is a different kind of rosary. Thanks be to the archive. Flow on new work. Oh, I love this, Bee. My upbringing was too English-flavored to have learned these matters, but as you know, while reaching back and back to my Catholic family line, the rosary is figuring large in the lore. Cari, I will miss your regular posts, which always seemed to arrive at the right time to make me pause, look around, and be still. Thank you for all you’ve shared over the years! Michele, thank you for following all these years. I promise to begin posting again soon. I am figuring out what form it will take, for it is primarily writing, so perhaps in the Library. I will set up notifications though, and I hope you will still find inspiration from my ongoing musings. Thank you also for the link. Robin Wall Kimmerer is an author I have been following, with her Braiding Sweetgrass high on my list of books to read. This was a poignant, heartbreaking and yet hopeful essay. I can only hope to be half so eloquent a writer.